William McGaughey is the author of A History of the Triple Existence: Matter, Life, and Thought. He is also the author of a book published in 2000: Five Epochs of Civilization: World History as Emerging in Five Civilizations. What is the contribution to human knowledge and understanding of either book? It is not that new historical facts are being presented but that the presentation of history in its totality is designed in a new way. McGaughey’'s contribution is therefore that of a cosmohistorical designer. Take the second book first. History of the Triple Existence is a book in the genre of Big History. Big History combines natural and human history. William McGaughey did not invent the scheme of Big History; David Christian, Fred Spier, Cynthia Stokes Brown, Craig Benjamin, and others did. However, he did contribute two elements of design in a unique way. First, the period of human experience in civilized society is organized according to the scheme of “five epochs of civilization”. (See below.) Second, thought is introduced as a new type of being, along with matter and life, whose emergence drives history in recent times. McGaughey's cosmology carries the development of thought forward from its glimmerings in the mind of prehistoric man to its culmination in artificial intelligence and robotics. With respect to Five Epochs of Civilization, the periods of civilization are each introduced by a new communication technology which, in turn, creates a new dominant institution in society. The introduction of ideographic writing, alphabetic writing, printing, electronic recording and broadcasting, and computer-based communication have spawned the ages of government, world religion, commerce and education, and entertainment, respectively, with the Internet and related products in the process of becoming organized as a new civilization. The five civilizations correspond sequentially to certain periods in world history, although the timing may differ between geographically based societies. What it is not: This is not a history centered upon the activities of government - dynastic successions, wars, laws, treaties, etc. That type of history is too narrow. McGaughey’s history is also not a moralistic scheme that sees history culminating in my particular nation or set of beliefs and values or even my particular species. Both books aspire to present a creation story of the world or universe as it exists. They show how a simple situation at the beginning developed into what we have today. Apart from the three comments on the back cover, it is too soon for History of the Triple Existence to have attracted much comment. However, Five Epochs of Civilization received a generally favorable reaction from reviewers in diverse parts of the world. This suggests that regional, national, racial, or ethnocentric bias has been kept to a minimum. 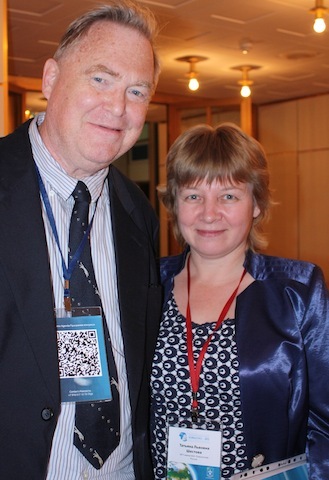 William McGaughey and Tatiana Shestova at the Globalistics-2013 international scientific conference at Lomonosov Moscow State University, October 25, 2013. 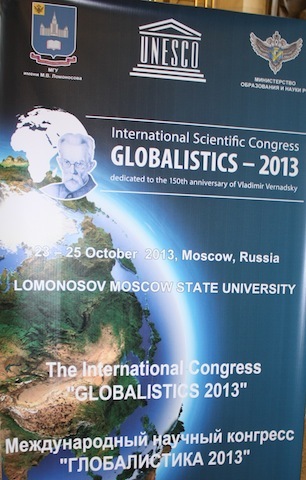 The conference was held in memory of Russian scientist and cosmologist Vladimir Vernadsky’s 150th birthday.